At the time of the Ghibellines, Siena was the rival of Florence. And it might still be, despite the fact that, in 1555, history attached it to the grand duchy of Tuscany, after a memorable siege! It certainly deserves to be thought of as a rival, by virtue of the wealth of its patrimony, the beauty of its monuments, and the charm of its old streets, where so many houses are in fact palaces! “Burnt Siena”, the color on the painter’s palette, is named after the hills on which Siena is built, and those which surround it. As can be seen from the contents of its churches and museums, it has also given its name to a school of painting in which gentleness of feeling is combined with lightness of touch. Its representativm include Simone Martini, Pietm Lorenzetti, Stefano di Giovanni (“Sasetta”), and Il Sodoma, from Lombardy, who was a pupil of Leonardo da Vinci. What Malaparte says about Tuscany in general is particularly true of Siena and its spiritual climate: “In Tuscany even the simplest, humblest, most ordinary things have a certain virtue which makes them miraculous.” Such a virtue was that of St Catherine, the mystic spouse of Christ, who had ecstasies and was stigmatized at Pisa in 1375, and who died, like her Master, at the age of thirty-three. In that same year, 1380, the future tough-minded reformer, St Bernardino, was born at Siena. 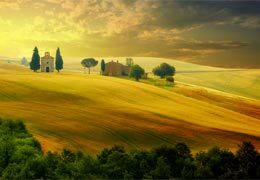 Writing of this delicate art and these vibrant souls, Malaparte enthused over the Sienese kindness of this “simple domestic civilization, half bourgeois, half peasant, a civilization of craftsmen, farmers, plowmen, market gardeners, millers, inn-keepers, wagoners, friars and nuns”. Legend had it that Siena was built by Senus, the son of Remus. And it is certainly true that the city’s heraldic device does include the she-wolf and the twins, Romulus and Remus, the founders of Rome. And independent republic in the 12th century, it clashed with Florence, having sided with the Ghibellines and triumphed in 1260. Ten years later, Charles of Anjou took the city and forced it into an alliance with the Guelph party. Then followed a succession of struggles and sieges, just as the beauty which we now admire in Siena was being created. 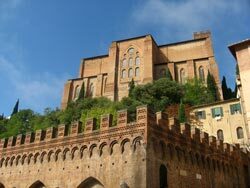 From the ramparts which still surround it there is a good view of the nearby red clay hills, truly the hue of “bumt Siena”. The scallop—shaped Piazza del Campo, in the heart of the city, is paved with bricks with a pattern of light-colored stripes. 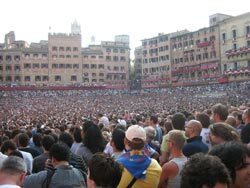 This is the setting, on July 2 and August 16, for the famous Palio delle Contrade, with its procession of Sienese wearing 15th-century costumes, carrying banners and emblems. This is followed by the special Palio horse race, which is quite dangerous as it is run on the slippery paving stones. The winner is given the Palio, a banner bearing an image of the Virgin. Eleven streets lead into the Piazza del Campo, which is surrounded by a harmonious jumble of old houses with red tiled roofs and crenellated palaces. The early 15th-century Fonte Gaia (Fountain of joy) is adorned with copies of the low reliefs of jacopo della Quercia, the originals of which are in the palaces. At the lower end of the square stands the Palazzo Pubblico, with its imposing brick facade and trilobate windows. The adjacent Torre del Mangia was built between 1338 and 1348. The palace itself is in the Gothic style, and was built between 1288 and 1309, a number of additions being made in the middle of the 14th century. The chapel at the foot of the tower, which contains some statues of saints and frescoes by Il Sodoma, is of the same period. The Palazzo Pubblico is now a magniﬁcent museum, in which art is exhibited in the rooms in which the government of the nine consuls once sat. Interestingly enough, a series of frescoes by Ambrogio Lorenzetti depicting the effects of good and bad government is located in the Hall of Peace. In the Globe Room there is Virgin with Baldacc/Lino by Simone Martini. Other exhibits include tapestries, sculptures and sacred objets d’art. A few yards away, on the other side of the square, a stairway behind the fountain leads to the Loggia delle Mercenzia, the former mercantile court. It was built between 1417 and 1428 in a Gothic style with clear Renaissance overtones. The pillars are adorned with statues, and the vaulted ceiling with frescoes. The other pole of attraction in Siena is the Piazza del Duomo, with the cathedral, the episcopal palace, the hospital of Santa Maria della Scala, partly of the 13th century, and the 16th-century Palazzo della Prefettura. The Duomo, which was started in the 12th century in the Romanesque style, from plans drawn up by G. Pisano, was completed in the 14th century, under the inﬂuence of Gothic architecture. The alternating bands of white, black and red marble give the facade, and particularly the elegant campanile, whose openings become gradually wider from the bottom, a distinctively original appearance. The interior of the Duomo is equally remarkable, ﬁrst and foremost by virtue of its mosaics (15th and 16th centuries) depicting biblical scenes and allegories, now partly covered by a floor. The breadth of the three naves, the alternating colors of the marble, the terra cotta images of the popes which adorn the cornice, and the hexagonal cupola with its galleries of slender columns all make up a striking picture, which is further enhanced by the statues of Donatello and the frescoes of Pinturicchio, as well as the pulpit by Nicolo Pisano, made between 1265 and 1268. One’s visit is completed by a walk around the Baptistery of San Giovanni (15th century), with baptismal fonts decorated with gilded copper low reliefs by Ghiberti, Donatello and Jacopo della Quercia. It is also worth while to visit the cathedral museum, located in another unﬁnished building, to which the present cathedral was to serve as a transept. 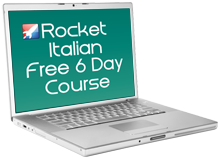 It contains works by G. Piasno, Duccio and Simone Martini. Siena is a city of culture and deep history, giving the traveller a unique opportunity to step back in time to an Italy that was full of inspiration, love and art. 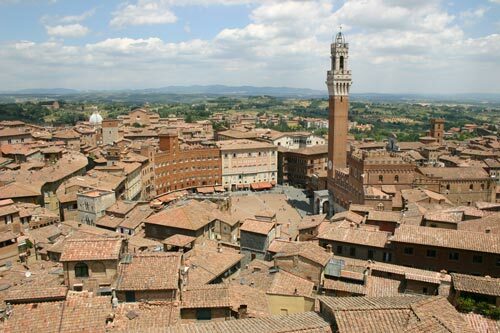 Visit Siena today and marvel at the history on offer.